One of the more popular counters used by DBAs to monitor the performance, the Buffer Cache Hit Ratio, is useless as a predictor of imminent performance problems. Worse, it can be misleading. Jonathan Kehayias demonstrates this convincingly with some simple tests. 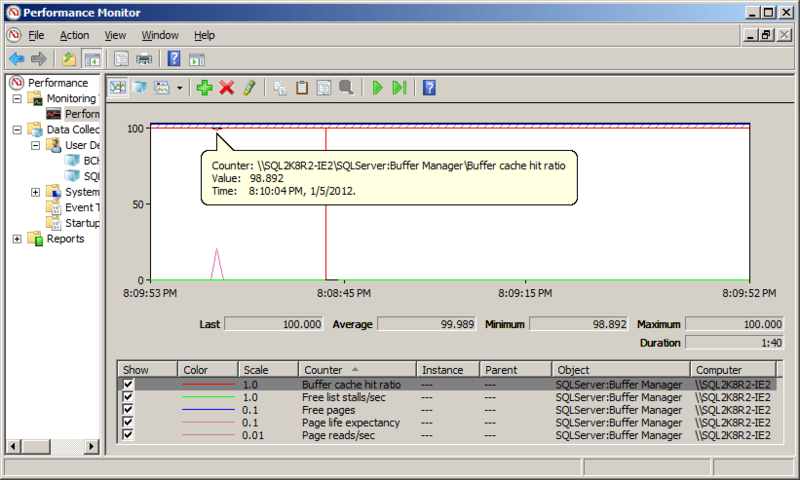 Commonly, this definition is interpreted like this: if the value of the Buffer Cache Hit Ratio (BCHR) counter is “high”, then SQL Server is efficiently caching the data pages in memory, reads from disk are relatively low, and so there is no memory bottleneck. Conversely, if the BCHR value is “low”, then this is a sure sign sign that SQL Server is under memory pressure and doing lots of physical disk reads to retrieve the required data. Prevailing wisdom suggests that “low” is less than 95% for OLTP systems, or less than 90% for OLAP or data warehouse systems. This article will, I hope, convince you that this interpretation of the BCHR counter value is completely incorrect and very misleading. In fact, I will prove that it’s entirely possible for SQL Server to be under significant memory pressure while displaying a value for BCHR that, viewed in isolation, would lead a DBA to assume that SQL Server was in fine heath. 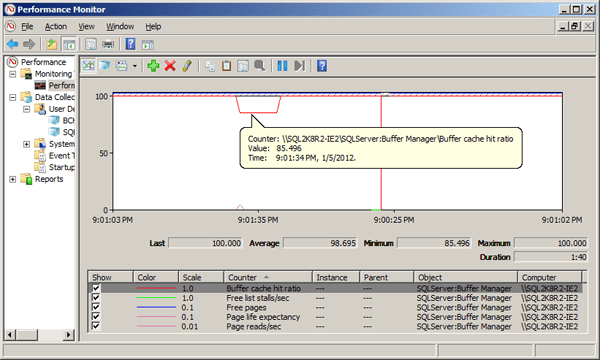 At the same time, I’ll demonstrate that there are far better counters for tracing memory usage patterns in SQL Server and for diagnosing potential memory issues. As a consultant, the BCHR is one performance counter that I never use in my work, and I stopped using it as soon as I discovered exactly why its value can be so misleading, and how misguided were the prevailing ideas about its meaning. 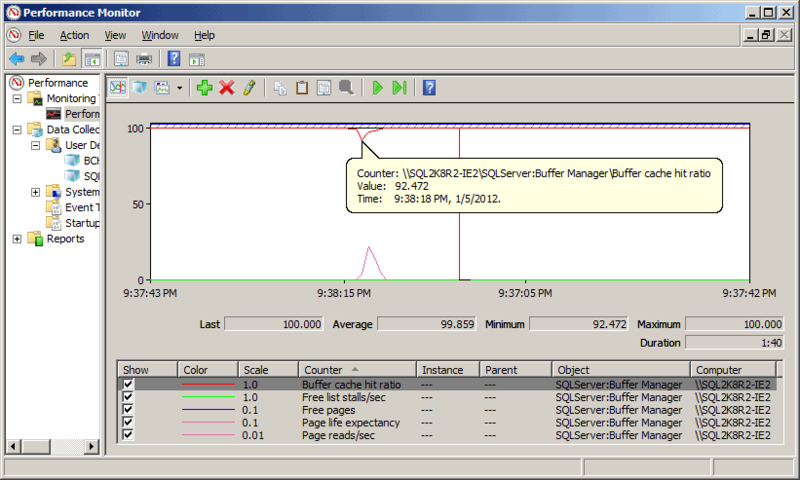 Consider, for example, the SQLServer:Buffer Manager\Page reads/sec counter. Without full knowledge of what the BCHR counter value really means, it seems reasonable to assume that if the BCHR value is high, then the Page reads/sec counter value should be low, since the high BCHR means that we don’t have to hit disk to retrieve the required data, right? Let’s find out! 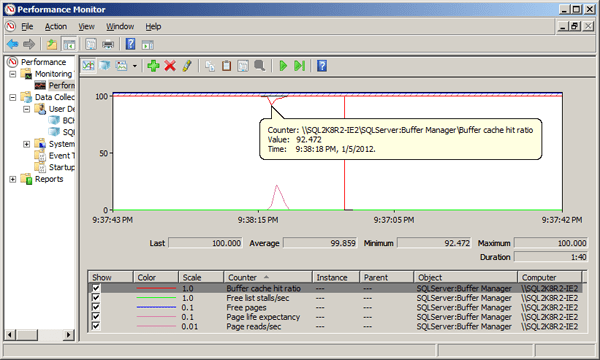 To investigate the true nature of the BCHR, we’ll need to perform some tests on an isolated instance of SQL Server. In my tests, I used a dedicated VM, with SQL Server Agent in a stopped state, and no other activity on at all on the instance, aside from the tests themselves. To follow along with this demo, you’ll need to install on your test instance the AdventureWorks and AdventureWorks2008R2 databases, both downloadable from Codeplex. In addition, you’ll need to run the script in Listing 1 to create the LowBCHR test database, and in it a sample table, TestTable, of a known size. This TestTable table is larger than 1GB in size, as confirmed in Listing 2, using the sp_spaceused built-in stored procedure. In Listing 3, we set ‘max server memory‘ option on the instance to 1024 MB, a value lower than the size of the table, meaning that SQL Server can’t cache the whole table in memory. We then clear all the caches on the instance so that we have a cold system against which to run our tests. 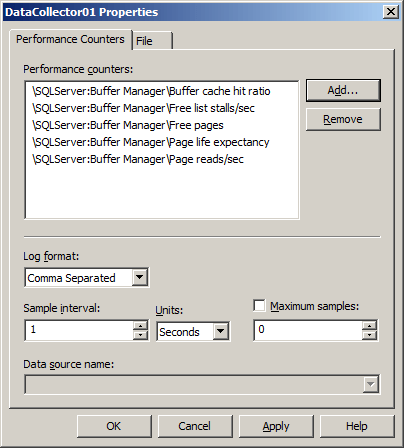 Next, we need to generate our performance counter collection set in Windows, in order to capture the BCHR values, along with the Page reads/sec counter values, and those of Free Pages, Page Life Expectancy, and Free List Stalls/sec, all from the SQLServer: Buffer Manager object. We’ll run a series of tests to investigate the behavior of BCHR, under various workloads and conditions. A variable query load, comprising three queries, will be executed against three different databases. 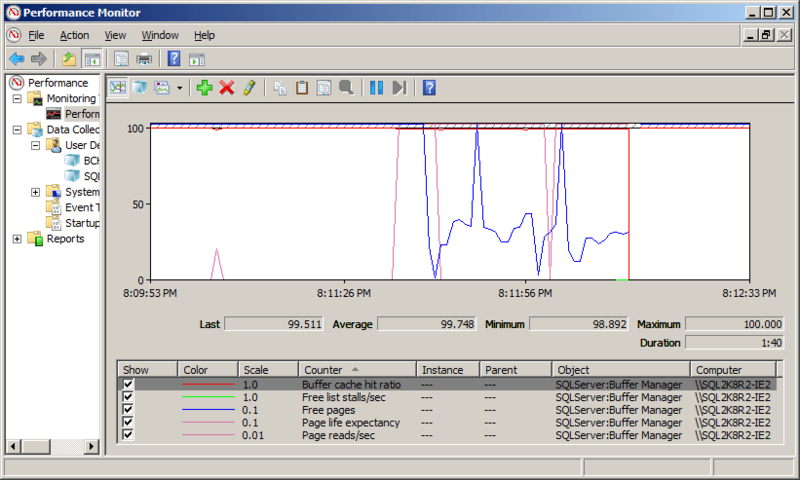 In these tests, the load was generated using the previously-referenced SQL Load Generator tool. The query in Listing 4 will be executed against both the AdventureWorks and AdventureWorks2008R2 databases. This will be the “base” workload in our tests. When we need create some memory pressure, we’ll introduce to the workload the query in Listing 5, which executes against TestTable in our LowBCHR database. With the system still idle, start the performance counter data collection; the counter values should be stable at this point. 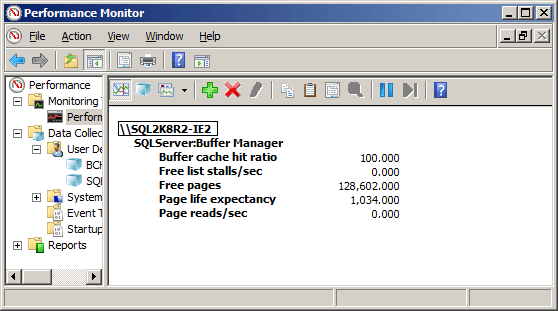 BCHR will be at 100%, Free Pages will be high (it depends on your specific system, but on the test system it was in the 128,602 range after freeing the caches), and Page Life Expectancy will increase by one for each second that passes (the starting value on my test system was 1034). To create our initial workload, the query in Listing 4 will be run against AdventureWorks and AdventureWorks2008R2. This will cause roughly 20MB per database to be read from disk into the buffer pool. When the queries begin execution, you should see an initial dip in the BCHR value, on the instance, and a corresponding spike in page reads/sec, as the required pages are read from disk, into the buffer cache, as shown in the data collected by Performance Monitor (Figure 4). However, the Page Life Expectancy continues to increase by a value of one every second and, even though the two queries continue to execute against the databases, the system shows near-zero impact aside from that initial drop in BCHR. The behavior observed in the initial test is what people generally expect with regards to BCHR value, and it shapes many people’s understanding of what the value is telling them. If this is the case with you, then prepare for a shock as, alongside our other two queries, we start up the third query against our LowBCHR database, and generate some serious memory pressure! The TestTable query (Listing 5) is going to require a full scan of the table, and the table is larger than the available buffer pool size, because we constrained ‘max server memory‘ to 1GB. Bear in mind that the queries against the AdventureWorks and AdventureWorks2008R2 tables will also be competing for this 1 GB of buffer pool memory. With the other queries still running, introduce to the load the TestTable query, simulating five concurrent sessions executing the query. The impact on our counter values is shown in Figure 5. Imagine for a second that we were only monitoring the BCHR value; as you can see, it shows barely a blip, staying comfortably above the “recommended” 95% value the entire time. According to this, our server is just fine. The other counters, however, reveal the true story: our server is under significant memory pressure and experiencing constant data cache churn, as evidenced by the fact that Page Life Expectancy bottoms out at 0 to 1, the number of page reads/sec skyrockets, and the number of Free Pages fluctuates but is generally below 200 for the duration of the test. Figure 6 shows a snapshot report of each counter value, at some point during the test. So why does the BCHR counter value fail to respond to the memory pressure? 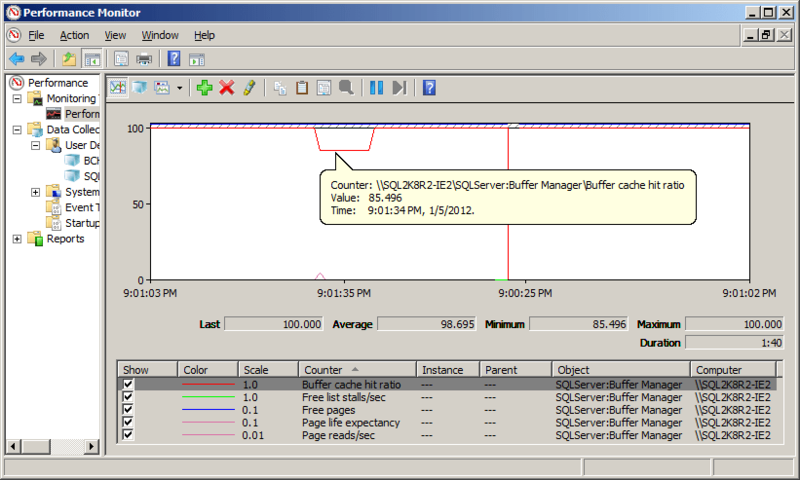 The reason is that the read-ahead mechanism in SQL Server, is keeping our buffer cache populated with the required pages. As long as the disk array can keep up with the I/O demands of the query workload, and the read-ahead I/Os can read the data in large enough blocks to keep the data churning in cache, then the required data will continue to be found in cache, rather than on disk, at the point that it is needed during the query’s execution by the query processor. As such, the BCHR will remain above 95%. The results of the previous test demonstrates that all the BCHR value really tells us is whether or not the read-ahead mechanism is operating efficiently; it tells us nothing of the memory pressure, and buffer cache churn, that the server may be experiencing. To prove this, we can disable the read-ahead mechanism in SQL Server using Trace Flag 652, and then rerun our tests. Alternatively, we could also place our LowBCHR database on an incredibly slow disk array, for example a USB thumb drive, instead of the internal SSDs in my laptop, to significantly reduce the I/O throughput available for read-ahead operations. To prepare for this test, flush the data caches once again using the relevant code from Listing 3, and then capture another initial counter baseline for the instance, as shown in Figure 7, which was taken after waiting a few minutes to allow the Page Life Expectancy to recover. As soon as we enable Trace Flag 652 for the entire instance, using DBCC TRACEON(652, -1), we take a hit on the BCHR that is higher than any of the previous hits taken during our tests, as shown in Figure 8. The cause of this dip isn’t entirely clear (since there is no activity on the server at this stage) but it is reproducible. Wait a few minutes to allow the BCHR value to recover and then, in SQL Load Generator, start the two queries against AdventureWorks and AdventureWorks2008R2, as per Test 1 (Figure 3). The dip in the BCHR value is bigger than we observed in Test 1, but it recovers quickly, as shown in Figure 9. With the two queries still running, start the third query against TestTable, but using only a single session, as shown in Figure 10. This time, with page read-ahead disabled, the BCHR value for the instance drops below the accepted value (to a value of around 90-91% in my tests), and remains there for the duration of the test. Figure 11 was taken after running the three queries for nearly 20 minutes. Finally, let’s up the memory pressure one more notch, by changing the setup of the SQL Load Generator to use five concurrent sessions for the TestTable query, replicating the conditions of our “maximum load” in Test 2. Remember that under this same load, with read-ahead enabled, we saw almost no impact on the values of the BCH counter. Performing the same test with read-ahead disabled, the impact on the BCHR value is very significant. As soon as multiple copies of the TestTable query are running concurrently, without read ahead enabled, the BCHR value bottoms out and never recovers completely. As shown in Figure 13, it is consistently low and has multiple near zero values that occur for long durations. 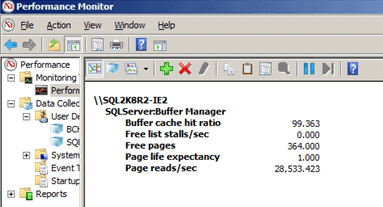 In conjunction with the behavior of the other counter values (very high page reads/sec, zero page life expectancy) this indicates, that for certain periods, the query processor is having to wait entirely on the pages to be read from disk and into cache, in order to execute any of the 15 concurrent requests in the test workload. My laptop test machine has a quad core i7 processor and dual solid state drives, with very low latency I/O response, but even so, as a result of the memory pressure and without the benefits of read ahead I/O operations, the pages generally weren’t in memory before they were required by the query processor for execution. In these tests, the I/O for the LowBCHR database was consistently 8K average per read (although this isn’t to suggest that there might not be conditions where it is still possible to get to get multi-page I/O or extent based I/O). If we re-enable read ahead with DBCC TRACEOFF(652, -1), the BCHR value once again returns to the ‘acceptable’ range. 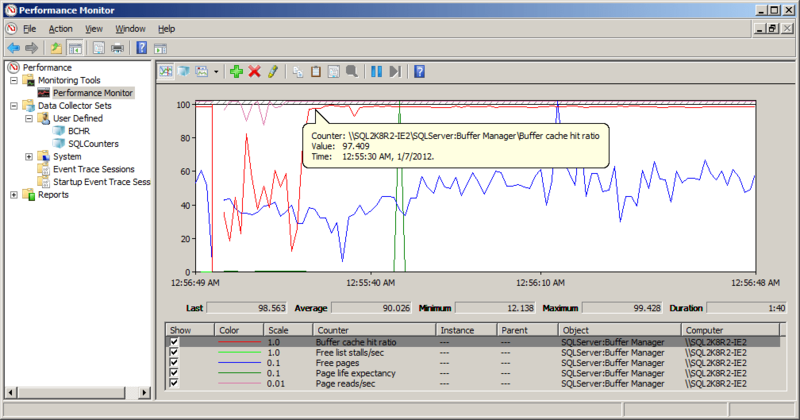 Many people continue to track the value of Buffer Cache Hit Ratio, as an “early-warning” of any potential memory issues on a SQL Server instance. What these tests prove, I hope, is that, in this regard, the value of BCHR is more or less meaningless. BCHR only responds to significant memory pressure in conjunction with I/O subsystem pressure, or possibly fragmentation i.e. under conditions that impedes page read-ahead to the point that SQL Server becomes much less effective at populating the data cache with the required pages, before the query processor actually requires them for use. To put it another way, the BCHR early warning alert is only raised once the house is already burning down. At the point that the BCHR has sustained values below 95 for an OLTP workload, the server has been experiencing significant performance problems for a long time, and the use of the other counters on the system would have yielded better results for diagnosing the problem. I stopped relying on the BCHR (in Oracle databases) when I heard how easy it was to manipulate. I heard that some DBA bonuses were tied to the BCHR. An Oracle expert, Conner McDonald, wrote a little PL/SQL procedure that would perform totally unnecessary i/o to bring the BCHR up to the target number. You passed in your target BCHR as a parameter. This was not done to increase the bonuses, but more as a proof that the hit ratio was not meaningful in tuning a database. It was very effective in convincing me that the BCHR was just a nice number, not a true database performance indicator. I plan recreating your steps on my own VM to help it all sink in. Awesome article. I always wondered why BCHR never indicated issues on systems I know were under intense memory pressure. I too have been relying on PLE mostly for quite some time. I think MS should seriously consider altering the text description for the counter to include this information. Thanks Jonathan for your amazing research in this paper. Clearly BCHR is SQL’s very own urban myth. You are right; there is no magic bullet and thanks to SQLSkills team and the great information you share, performance analysis is becoming more of science instead of an Art! If read-aheads are fast enough to get the needed pages in the buffer (i.e. BCHR = 100), wouldn’t query performance be the same? In other words, BCHR might not say whether you have enough memory, but it does tell you memory (or slow disks) is causing queries to suffer. Great experiment with very clear explanation! I wish there would be more articles like this. Could the BCHR temporary dip in Fig. 8 be explained as follows? — when the read-ahead is stopped, its “pre-cache” is lost and the stream of data for those system processes has some catching-up to do until it recovers the lost portion. I would love to see…..
…a diagram showing me data’s journey from disk to when it’s ready to be sent to the client, along with which counters indicate bottlenecks at which layer. A picture tells a thousand words. Putting it very simply (forgive me if this is inaccurate), we have physical disk, some kind of physical disk cache, windows memory management, SQL Server memory management, consisting of some SQL Server read ahead magic, and the buffer that it reads-ahead into. For a casual DBA like me this would be great to see. …an idea for those more devoted and knowledgable than myself. Started reading this over the past weekend during a monthly shutdown at work while I waited for others to complete their work. 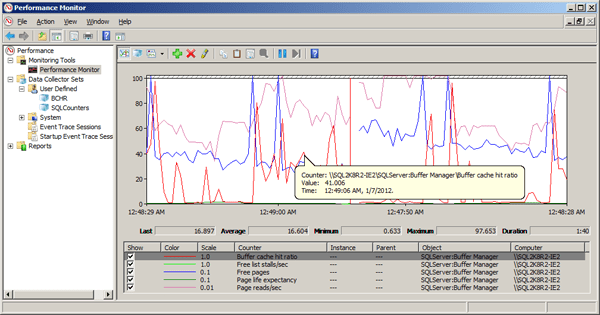 Experimented using a Parallels VM with Server 2008 R2 and SQL Server 2008 R2…the results matched your examples perfectly. Even better, I applied your examples to solving a problem in production. A purge process we were running against a production database hit a snag. After we gave up on the process, I tried to figure out why the total PAGEIOLATCH_SH wait type was so high. I decided to revisit the process in our test environment since I couldn’t really run it in production during production hours. By chance I decided to turn on the same counters used in this example…and BAM…like lightening it became clear what was the culprit. A combination of memory pressure and higher than normal disk activity…and the whole time BCHR appeared to be just perfect! Thanks again Jonahtan! This article was great and kept a few more hairs on my head! It was great reading this article. This cleared all the doubts that I had regarding the meromory counters & their usage. Thanks Jonathan !!! Thank You, i really need it. Thanks for the article. It explains BHCR very well. I mostly rely on PLE for determining Memory pressure. I would like to ask you an question. is it fair to say that if PLE is low and free pages will have low value and vice versa? Can there be cases where Page life expectancy stays low but Free pages goes from a low value to high value during same period? Jonathan, you did it again! I enjoyed reading this article very much! Two years ago I prepared for a presentation that I was going to do at Tech-Ed, and I wanted to simulate memory pressure. I wanted to show a deline in BCHR as a sign of memory pressure. So I set up an environment similar to the one you described in your article, performing a table scan on a table that is larger than the sice of the cache. No matter what I did, I couldn’t get that counter below 99%. I verified that there is a lot of IO activity. 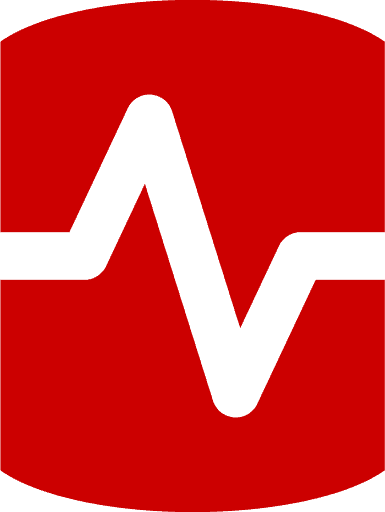 I also verified that pages in the buffer pool are changing all the time by examining sys.dm_os_buffer_descriptors. Everything else showed that the pages are read from disk to cache all the time, and still that BCHR stayed above 99%. It drove me crazy. I was at Tech-Ed already, a day before my presentation, and that part of the presentation was still not ready because I couldn’t demonstrate what I wanetd with the BCHR counter. Then I met Sunil Agarwal from Microsoft. I showed him my scenario and asked him why wouldn’t the BCHR counter drop. Sunil took a very qucik look and immediately explained to me that this behavior is due to the read-ahead mechanism, just like you explained here. It was a shock to me. I investigated it some more, and I realized how it works. I found other ways to demonstrate memory pressure in my presentation, and I’m not using the BCHR counter for diagnosing memory pressure since then. I planned to write a post about it, but I have never gotten to actually do it. I’m so glad that you did it, because I think it’s very important for every SQL Server DBA to understand it, and you did a wonderful job explianing it. Excellent article Jonathan. You mention "necessary" memory counters, one of which is Free List Stalls/sec. Do you happen to know how this relates (if at all) to the "Buffer Partition:Free List Empty" counter? The definition for this counter is ‘Number of times per second a free page was requested and none was available.’, which sounds like it ought to lead to a wait condition of some sort. Our system has a consistently zero value for free list stalls (which is good), but has Free List Empty counts that are regularly in the thousands per second. I can find next to no explanatory info on the implications of high values for this counter anywhere. But, as Michel suggested, if read-aheads are able to keep the BCHR low, then does it really matter that you are doing a lot of them? Another way of thinking about it is this: if BCHR is high, and PLE is low, and you add cache, will throughput increase? I have my doubts. Almost certainly I/O would decrease, PLE would increase, but that’s just an improvement in something that wasn’t affecting throughput in the first place. I should have said "able to keep the BCHR high," Not low.